16 ounce Sweet Cauliflower. 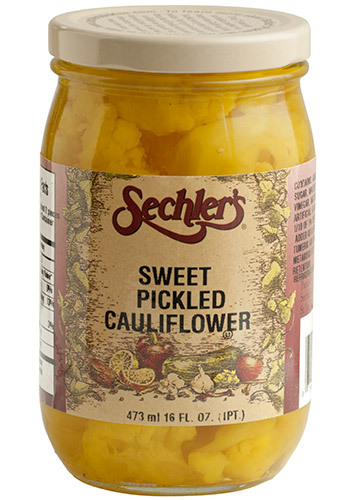 We use pure sugar to sweeten these tasty cauliflower florets. a Preservative, Turmeric and Sodium Metabisulfite added as Color Retention. From Darrell of Connersville, Indiana on 1/18/2018 . Will order again,the best sweet cauliflower I have found in a long time. From Richard Dragon of Salem, Massachusetts on 7/20/2017 . From Jamie Fulghum of Charlotte, North Carolina on 2/17/2017 . I simply love Sechler's pickles. I can only find the bread and butter ones in Charlotte and I buy them all the time and use in all recipes where regular sweet pickles are required. They make EVERYTHING better and I am not kidding. I do make the best deviled eggs and potato salad using them. Wish I could get them here since shipping is so expensive. Thanks. From Marion of Windham , New Hampshire on 12/23/2016 . I love your sweet cauliflower I would recommend them to everyone I wish they were in the stores around here.